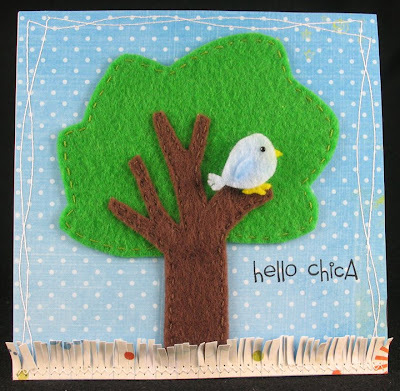 For the tree, I used the Cricut and the My Community cartridge to cut out a pattern from plain printer paper, and for the bird I used an image from Kim Hughes' Mocha Chica set. The sentiment is from Kim Hughes' The Landing Pad set. I wanted the card to be whimsical, so I used some blue polka dot paper from Fancy Pants (The Daily Grind collection) for the sky. When I turned the sheet over, it had this cool decorated notebook paper design on the back that I thought would be fun for grass. I fringed a strip of it and zigazag stitched it onto the card. Keeping my fingers crossed that Cath likes it! Hope you like it too and TFL! Today's card was made for a bunch of challenges that I'll describe below. Use It! - (a multi challenge all in itself!) use something inspired by nature (the sand dollar charm), use polka dots, use your favorite embellishment (a tie between ribbon and buttons - I used both! ), and mail your creation to someone special. TFL and I hope you like it! Other materials used: patterned paper - Imaginisce (A Shore Thing collection); cardstock - Papertrey Ink (Summer Sunrise), Bazzill (Cajun); ink - Tsukineko (Graphite Black Brilliance), Papertrey Ink (Summer Sunrise); long classic and scalloped Nestabilities; ribbon - Pink Hedgehog Paper Crafts; buttons - Papertrey Ink (Lemon Tart); sand dollar charm from stash. 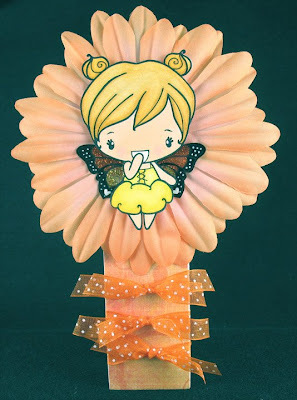 I used Just A Girl along with Papertrey's Kraft cardstock and some papers from a REALLY old QVC scrapping kit. The zig zag stitching on the middle border was hand stitched as my machine couldn't do a stitch that wide. Her dress and boots were paper pieced and the rest was colored with Copics. I also added a tiny little heart pearl in her hair. I used my own method to slightly enlarge the scalloped square Nestie to fit better on my card which is 5" square. For just a little bit of extra interest, I embossed and glittered the edges of the panel under the Gorjuss girl. I hope you like it and TFL! Other materials used: Fresh Snow ink - Papertrey Ink; large flower - Prima; small flower - Paper Wishes; ribbon - May Arts; glitter chipboard letters - American Crafts; border punch - Martha Stewart; tiny heart pearl - MimiLolo Etsy store; Art Institute glitter. 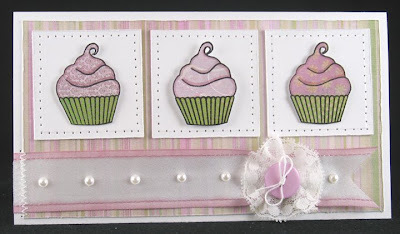 I used the Cupcake Mix & Match set with Memory Box patterned papers. I added some Stardust glitter pen to all the cupcake tops but just couldn't get a decent picture of the sparkle, so you'll have to take my word for it! 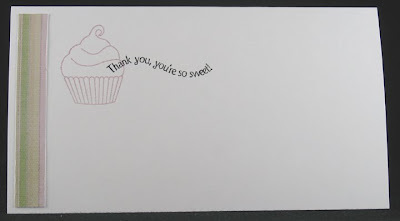 All the cupcakes and liners were paper pieced, shaded with Copics, cut out and popped up. I colored the edges of the ribbon to match the papers and made the little rosette myself. I used Cindy Lyles' tip about stamping the same image on the inside with a lighter color and then stamping the sentiment over it with a darker color. I don't usually finish off the insides of my cards - I obviously need to work on that! Anyway, I hope you like it and TFL! Today's card was made for the Moxie Fab World Lovely as a Tree challenge and uses images from a Softpencil digi stamp set. As soon as I saw the tree image, I knew I wanted to use it - such a cool design!! I actually added the bigger top to the tree because I wanted this wider tree top shape to match with my quote. I paper pieced the trunk and the top by first printing on regular paper, then taping patterned paper over the images on the printer paper and running through the printer again. 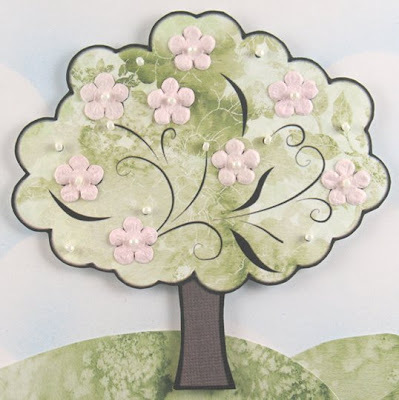 I glued Prima flowers over the flower images that were already on the tree and sewed seed beads onto all the flowers and all the dots on the tree design. For the sky, since I couldn't find my cloud stencil, I made my own by cutting out various sizes of circles with my Nestabilities, and then taping the circles together. I then airbrushed the sky using my stencil. The hills were hand cut and the sentiment was printed from the computer and hand cut as well. For the tree top and hills I used the Basic Grey Porcelain pad and for the trunk I used the DCWV Latte Stack. I hope you like it and TFL! I just found a blog that has a cupcake inspiration challenge every week, so you know I HAD to play! 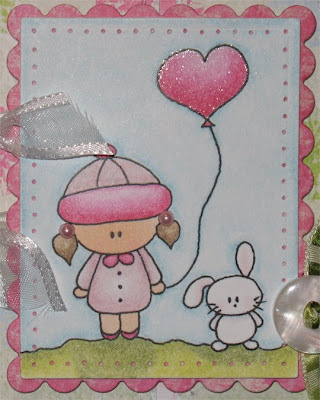 The blog is Hope Stamps Eternal and this week is Challenge #12. 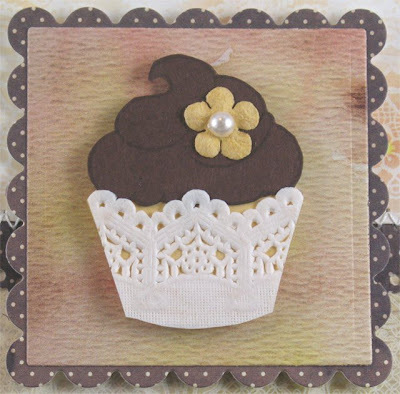 To make the cupcake, I stamped one of the images from The Greeting Farm's Susie Surprise set on Dark Chocolate cardstock with the matching ink and cut out just the top. Then I drew an appropriately sized bottom to match. I didn't use the bottom of the original image because I wanted my cupcake to have a bigger bottom. I cut the liner portion out of a paper doily I've had forever and the "cake" from some Saffron cardstock. The final touch is a Prima flower with a little pearl center. The sentiment is from the Happy Chef set, all the patterned paper is from the Basic Grey Porcelain paper pad, and I used the Doily Lace Edge punch for the border. I hope you like it and TFL! I used the Miss Anya Collection and a sentiment from the Wonderland set. I used a sketch from Papercrafts magazine and some really old patterned paper from My Mind's Eye. She was colored with Copics, entirely cut out (even those skinny little flower stems and leaves), and popped up with foam tape. The scalloped panel was airbrushed to match and I did a bunch of machine stitching on the card. Lastly I added a tiny little heart pearl to her hair bow, 2 micro half pearls for her shirt buttons, and bitty butterfly punches on either side of the sentiment. 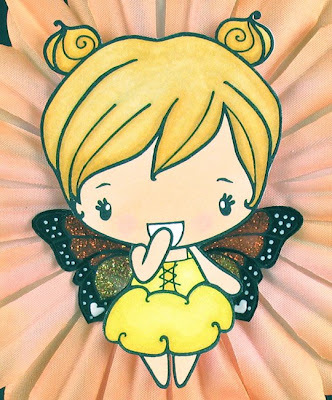 I stamped Flutter Anya on cardstock, colored with Copics, and cut her out, minus the wings. I also stamped her on acetate and "colored" the back with 3 different colors of glitter. I added white dots and filled in the little hearts with white permanent marker also. Then I cut out the wings and mounted them behind the Anya with foam tape. I hope you like them both and TFL! 2. Pass the award on to 15 other blogs that you've newly discovered. 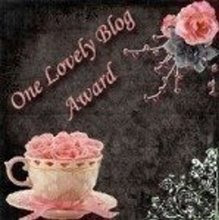 I don't have 15 newly discovered blogs that haven't already received the award, but I do have 1! Creations by Wendalyn, my fellow Softpencil DT member. Her cards are wonderful and I especially love her combining of the Zindorf techniques with cute images (I am a huge fan of cute!). Please check out her blog and leave her some love! I used the set Coffee With Friends and 6 different papers from DCWV's La Creme stack. I couldn't figure out how to incorporate a sentiment into the design, so I added a teeny little tag stamped with merci from Papertrey Ink's Mixed Messages set. I cut 2 little slits on either side of the top cup's handle and tied the tag on with a bit of crochet thread. For the larger scalloped borders, I used Stampin' Up! 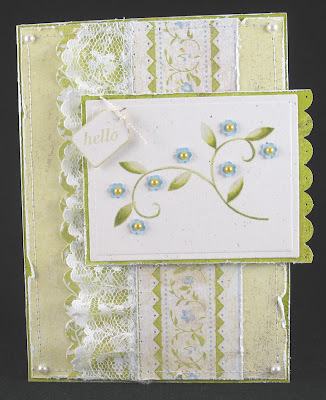 's scalloped border punch, and for the smaller borders, I used a mega scalloped Nestabilities die. I thought it looked a little plain so I sewed a seed bead to each scallop on the larger borders. 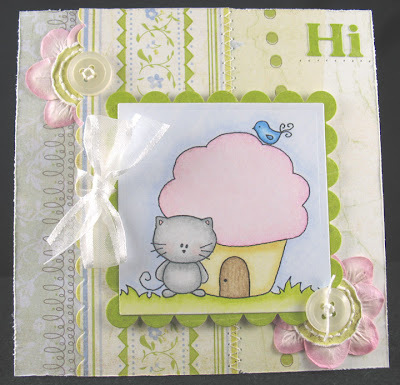 This card is also for the Our Creative Corner challenge to use border punches. Today's card uses another adorable digi image from Softpencil called My Bunny and Me (you can find it at the Softpencil Etsy shop). I colored the image with Prismacolor pencils and odorless mineral spirits, plus Copics for her face, hands, and legs. I've heard of people combining the 2 mediums and I was afraid they would look funny together, but after doing it here I can say that it looks fine. I added 2 micro pearls for her hair bands, but unfortunately they kind of look like earrings so I don't think I'll add them again in the future! The sketch I used is a Jen del Muro Sketch For You To Try. I also played in a Pile It On challenge which was to use at least 2 different ribbons. 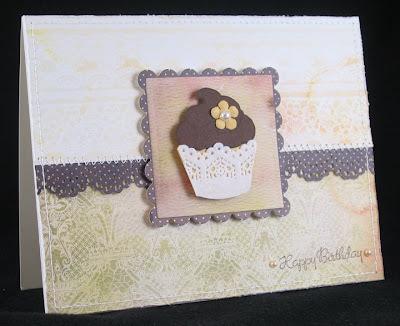 My card also qualifies for the Stampin' for the Weekend challenge which was to use a digi stamp image. Whew! That's a lot of challenges for me on 1 card! I hope you like it and TFL! Other materials used: sentiment - Papertrey Ink (Simple Little Things limited edition set); patterned paper - Fancy Pants (Key Lime collection); white cardstock - Georgia Pacific; Classic and Scalloped Rectangle Nestabilities; ribbons - May Arts; tiny pearls - MimiLolo Etsy store; button from stash. 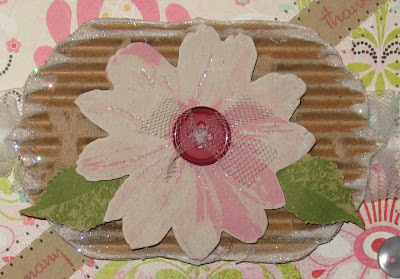 The latest Kitchen Sink Crew Challenge is to "take some previously used non-stamping item that is headed for the trash can and turn it into a component in your Kitchen Sink project either as a layer or embellishment of some sort!" I've seen a lot of people using corrugated cardboard in their projects so I decided to give it a try. My card didn't come out at all like I had wanted, but I'm posting it anyway because there are some elements that I like. 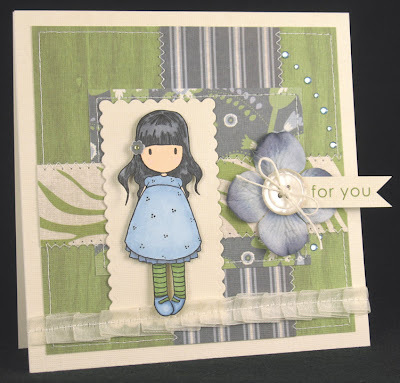 I used 3 Step Daisy (definitely one of my fave KS sets) and a sentiment from Never a Loss 4 Words. I traced a Nestabilities Labels 4 shape onto a piece of cardboard, cut it out, and then stripped most of the top layer of paper off one side. 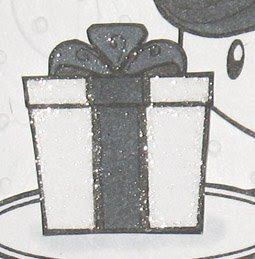 I then inked the edges with white ink, covered with glue and glittered it. 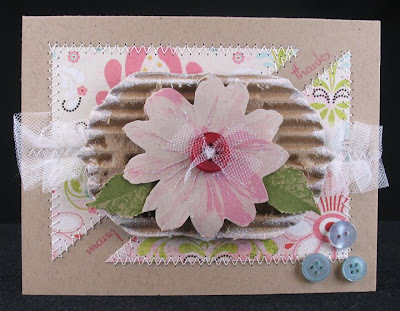 For the daisy, I stamped on kraft cardstock first in Papertrey Fresh Snow, then SU! Mauve Mist, Rose Romance, and Rose Red. I also added a little glitter to the flower and a button tied with tulle. The leaves were done with Certainly Celery and Old Olive. I like how the sewn strip of tulle came out - much softer than using ribbon. But I don't like how thick this card is! This sucker is definitely not going through the mail without special packaging! TFL! After posting this card that I made with a Softpencil digi stamp, the owner and illustrator, Elizabeth, asked me to be on her design team!! It's my very first stamping DT gig and I'm thrilled that it's for Softpencil because I think Elizabeth's designs are super cute!! I'll be showing a card or other project made with Softpencil designs at least once per week, so be sure to come by and check them out! 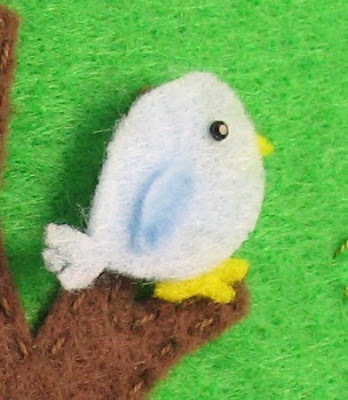 Also, if you've got some time, please check out the Softpencil blog and Etsy store, and senior DT member Shelley's blog. Thanks! Today's question of the day on The Greeting Farm blog was how do you store your TGF stamps? Well, instead of just posting a comment about it, I decided to show you my method. 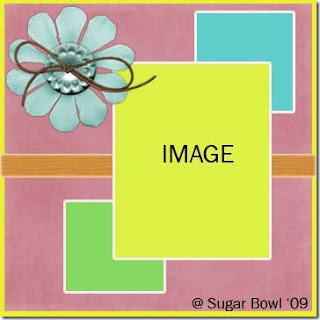 For the single stamps, I just stamp the images on a piece of paper and slip it into an 8.5" x 11" page protector. Then I stick the stamps to a storage panel that's opposite the stamped images. You can fit 9 Anyas/Ians per panel. For the sets, I cut the included image sheet down a little, and stick it to a sheet of paper (it hangs out a little at the top), and then again I stick the stamps to a storage panel opposite the images. As you can see, 4 sets will fit perfectly on one storage panel. You can also see (on the Pretty Hat image sheet) that after I create a mask for an image, I'll stick it onto the image sheet to use again later. I have 5 storage panels with corresponding image sheets in page protectors and the binder is very full. Since you can stick stamps to both sides of the storage panels, you can fit a LOT of stamps in the binder. I have 25 sets, 9 Anyas, 5 Ians, and 3 fairies in my binder with room for more! Unfortunately, I haven't gotten around to decorating my binder yet, but I have plans to do it in the future. Hope this helps someone solve their storage issues! TFL! 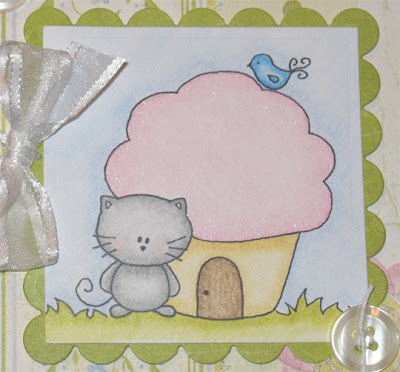 Today's card was made with the most adorable image from a company I just found called Softpencil - Digital Stamps (the link to her Etsy store is on the blog). I found Softpencil through Shelley's blog, Artful Achievements, after she was so kind as to leave a comment on one of my cards. I'm so glad she did, because not only does she make wonderful cards, but I also found some of the cutest digi stamps ever! This image is called Home Sweet Home and isn't that kitty too cute?! And then she lives in a cupcake which is why I HAD to get it!! I colored the image with Prismacolor colored pencils and odorless mineral spirits - a technique which I tried before but couldn't get to look quite right, so I gave up. But then I bought this image and thought right away that it might look nice done with that technique so I got out all my supplies and practiced and practiced somemore. I think it came out pretty nicely this time, so that means I'm going to keep practicing and hopefully I'll get better at it! I adapted the layout for this card from a scrapbook page by Heather Bowser that was in the Feb/Mar 2009 issue of Scrapbooks Etc. magazine. Even though I haven't scrapped in ages, I still get a few magazines for inspiration. I hope you like it and TFL! 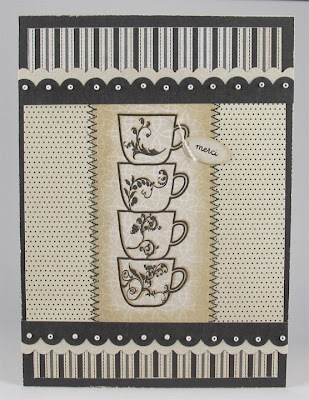 Other materials used: patterned paper and letter stickers - Basic Grey (Lilykate collection); Prima flowers; May Arts ribbon; Classic and Scalloped Square and Mega Scalloped Rectangle Nestabilities; 1" circle punch; buttons; crochet thread. 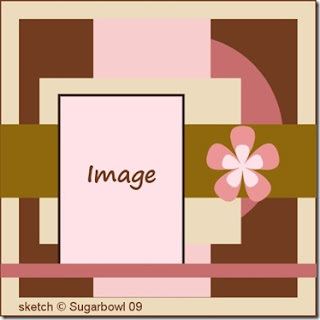 Today's card was made for The Sugar Bowl's Challenge 12 which was to follow the sketch below and use the colors blue and green. I used a Gorjuss image called Purrfect Friend (she has a cat, but I didn't include it here because it didn't fit), colored with Copics and cut out. I added the little flower in her hair, punched from a bit of the same patterned paper and decorated with a tiny rhinestone. I hope you like it and TFL! 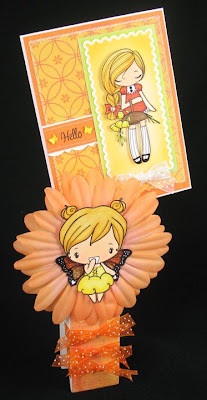 Other materials used: Prima flower; rubon and organdy ribbon - Stampin' Up! 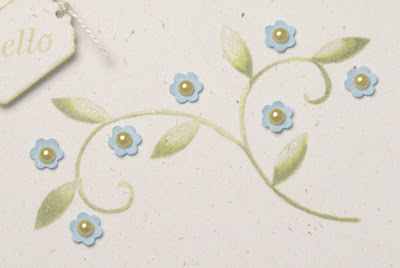 ; twine - Papertrey Ink; tiny flower punch - Fiskars; button and rhinestones from stash. It was really difficult not to use ANY color at all, especially when his face and hand were begging to be skin-colored, but I resisted the urge! For the finishing touches, I added some black organdy ribbon and rick-rack, a little sentiment banner, some Prima flowers, and half-pearls. Although I really like how it came out, I still would have liked to add just a little pop of color somewhere! Hope you like it and TFL! 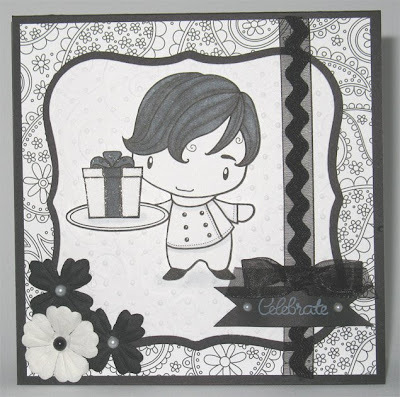 Materials used: Happy Chef set - The Greeting Farm; cardstock - Stampin' Up! (black), Georgia Pacific (white); patterned paper - Doodlebug; Graphite Black Brilliance ink - Tsukineko; Fresh Snow ink - Papertrey Ink; Copic markers; Stardust glitter pen - Sakura; Nestabilities Labels One - Spellbinders; D'Vine Swirls and Swiss Dots embossing folders - Provo Craft; Prima flowers; ribbon - Stampin' Up! ; rick-rack from stash; pearls - MimiLolo Etsy store. It seems that when I want a really "artistic" card, I always turn to my Papertrey stamps, and this card was no different. I stamped the branch image from Beyond Basic Borders in Spring Moss, and then added shadows and highlights with Prismacolor colored pencils. I also added some Sakura Stardust glitter pen spread with a waterbrush on the highlight areas, and also on the little blue flower punches. I just LOVE using the Stardust/waterbrush technique for a really pretty, subtle glimmer! I used 2 patterns (the second print is under the lace) and 2 solids from Basic Grey's Lily Kate collection, and Rustic White cardstock from Papertrey. I added some ruffled lace from my stash with a zigzag stitch, and did a straight stitch around the whole card. And of course I did a lot of distressing around most of the edges of the papers. Here's hoping I make the Top 30!! TFL and I hope you all like it! 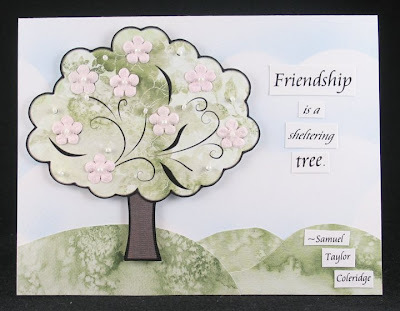 Other materials used: Simple Little Things (sentiment), Spring Rain cardstock - Papertrey Ink; tag - Quickutz; Classic Rectangle Nestabilities - Spellbinders; scallop border punch - Stampin' Up! ; flower hand punch - Fiskars; half pearls - MimiLolo Etsy store; crochet thread - DMC.